The Federal Government targets achievement of 80 per cent financial inclusion of its adult population by 2020, a revised National Financial Inclusion Strategy released on Wednesday by the Central Bank of Nigeria (CBN) has shown. The strategy first adopted in 2012 aims at reducing financially excluded adult Nigerians from 46.3 percent in 2010 to 20 percent in 2020. 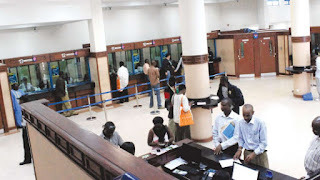 Latest figures released by the Enhancing Financial Innovation and Access (EFInA) department of the CBN showed about 36.6 million Nigerian adults, representing about 36.8 percent of the Nigerian adult population, do not have access to formal financial services. The overall goal of the strategy, the CBN said, is to promote a financial system accessible to all Nigerian adults at an inclusion rate of 80 percent (formal and informal). The focus of the strategy will be to promote agency banking, mobile banking/mobile payments, linkage models and client empowerment. The CBN said on Monday that a two-day national financial inclusion conference is scheduled for Abuja on Thursday and Friday for the launch of key policy documents aimed at facilitating the attainment of the financial inclusion target by 2020. The CBN said in a statement sent to PREMIUM TIMES that over 400 delegates are expected at the conference where key policy documents, namely the revised National Financial Inclusion Strategy (NFIS 2.0), the Financial Literacy Framework, the Consumer Protection Framework and the Consumer Education framework, would be unveiled. The conference also aims at ensuring newcomers into the financial inclusion bracket are adequately protected and educated in line with the provisions of the policy documents. The conference to be declared open by the CBN governor, Godwin Emefiele, will update participants on the growing sophistication of the financial market. The meeting will also talk about the competitive environment the financial services providers operate, and the benefits and value of providing access to financial services among others. While hoping to enhance consumer confidence and trust in the financial services to facilitate progress towards achieving 80 percent financial inclusion target by 2020, the CBN said it will seek to obtain customers feedback on how best to implement the financial inclusion policies.